“Charming fairy-tale fun.” –Sarah Mlynowski, author of the Whatever After series. 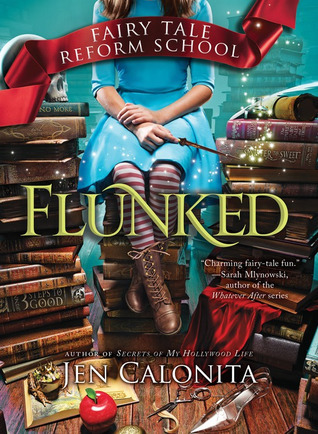 “Flunked is spellbinding and wickedly clever. Gilly is smart, spunky, and a hilarious narrator!” –Leslie Margolis, author of the Annabelle Unleashed and the Maggie Brooklyn mysteries. “Flunked is a fresh and funny take on the enchanted world. (And who hasn’t always wanted to know what happened to Cinderella’s stepmother?”)” -Julie DeVillers, author of the Trading Faces identical twin series and Emma Emmets, Playground Matchmaker. This is such a fun book to read! Gilly is not exactly what you would expect to find in a fairy tale heroine. She's not as vile as a villain, but she's far from princess perfect. Unfortunately for her, that makes her a prime candidate for Fairy Tale Reform School. She quickly finds herself booted from her shoe and plopped right into the middle of a school for misfits. But the school isn't what it seems; something is amiss. Younger readers will appreciate this book the most. It's quirky and fast paced. With only 256 pages, there isn't a lot of room for deep character development, but that's ok. You can still connect with Gilly and her plight. The supporting characters add a nice touch of humor and warmth to the story. It's not just about getting back to her family or stopping a diabolical plan; Gilly also has to learn to look beyond stereotypes and discover who she truly is. The writing was easy to follow, and I really enjoyed seeing the villain reimagined. The plot was quickly moving; no lulls here! Towards the end I began to think it was wrapping up too quickly, but then I realized it's the beginning of a series. I will anxiously await to see how Gilly's adventures continue. Looks like a fun read! Thanks for the giveaway! Oh, goodness! That's a tough question!! I would say Maleficent because I love her as a villain but I don't think I'd actually want to be anywhere near her! Lol! Thank you for the giveaway opportunity! I'm really trying to get my hands on this book since I saw it on NetGalley! Lol, the quiz said I should have the wolf as my professor! I love Maleficent! One of my all time fave villains!